This page provides a more detailed description of how to configure the SAM C21 SERCOM peripheral into an SPI Slave. It will cover the key registers to be configured to implement a simple SPI Slave application where the SAM C21 accepts and responds to SPI commands sent by an SPI Host Application running on a PC. The SPI Slave has several configuration possibilities that need to be considered when interfacing to external SPI Master devices. 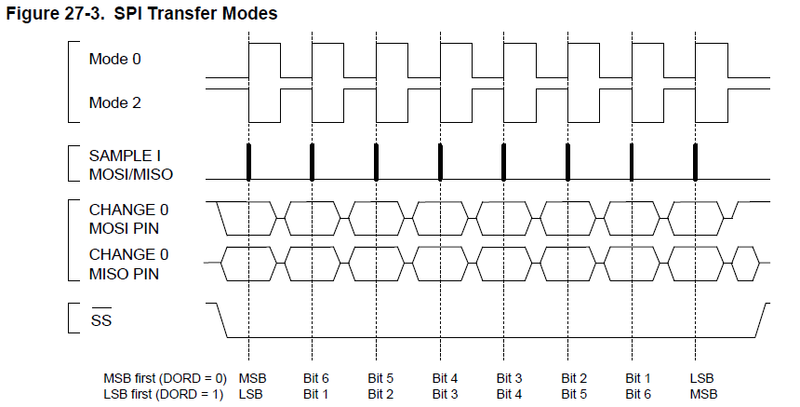 The SPI Slave of the SAM C21 supports all four data transfer modes. There is only a single register interface for the SERCOM in SPI Slave mode, the DATA register. The block diagram above shows these as two separate paths but they share a common register address. Data to be transmitted by the SPI Slave is written to the DATA register. Data to be received by the SPI Slave is read from the DATA register. The external clock provided via the SCK pin function provides the necessary module clocks. There is no need to configure the BAUD register in SPI Slave mode. Per the previous diagrams, an SPI transaction is started with the SS line being asserted by the Master. This detection is automatically detected by the SERCOM module. However, there is an option to allow the device to be woken up when the SS line is asserted by enabling the CTRLB.SSDE bit. In SPI Slave mode, there are three optional slave addressing modes. These modes work by performing the desired address comparison on the first data byte received by the SERCOM module after SS is asserted. Enabling Addressing is selected via the CTRLA.FORM register bits. The desired addressing mode is selected by the CTRLB.AMODE register bits. 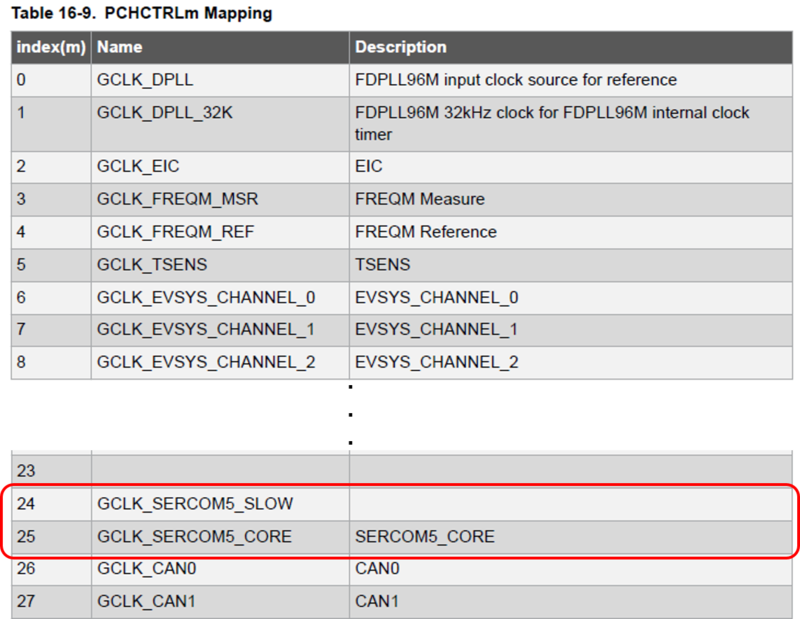 Use the following instructions when configuring the SERCOM peripheral to work as an SPI Slave. 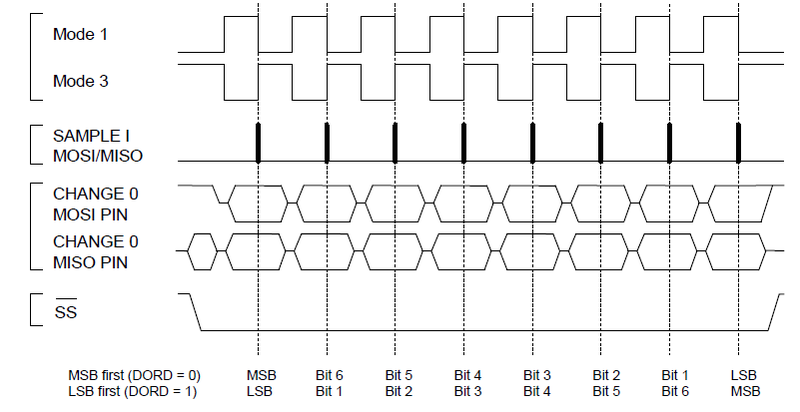 This section explores a simple and basic configuration, where the SAM C21 is connected as an SPI Slave to an MCP2210 SPI Master device, which issues commands from a PC Terminal Application. More advanced applications might use extra functionalities from the peripheral, but the basic principle remains the same. Use the “I/O Multiplexing and Considerations” section of the "SAM C21 Family Datasheet" to determine what pins can be used and for which SERCOM. For the example application that follows this page, PB00, PB01, PB02 and PB03 are used, along with SERCOM5. If these are not configured correctly, the module will not operate properly with the pins assigned. See Step 4 below for a code example that initializes these bit-fields. The SERCOM peripheral is implemented on the Advanced Peripheral Bus C (APBC). To communicate with the register set, we enable the synchronous clock to the peripheral using the Main Clock Controller (MCLK) register set. The Generic Clock for a peripheral must be configured by writing to the respective Peripheral Channel Control register PCHCTRLm. The Generator used as the source for the Peripheral Clock must be written to the GEN bit field in the Peripheral Channel Control register PCHCTRLm.GEN. Each SERCOM module has two clock input selections, a Main clock and a Slow clock. Only the Main clock needs to be assigned for SPI Slave operation. Note that the module is not enabled until interrupts are configured. After all the steps of this configuration are done, the system is ready to receive commands/data. Visit the SAM C21 SERCOM SPI Slave Example Project page to see the complete working demo.